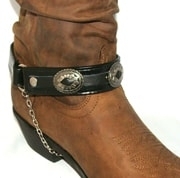 Our Products >> Cowboy Boots >> Cowboy Boot Access. boot chain with crystals & studs. Leather boot chain with crystals & studs.